Yet another Intimidation Clothing alum is now a member of the UFC’s roster. This time, it’s Charlie Brenneman, who will begin his second stint with the world’s largest organization when he steps in as a late replacement for Jason High to take on Beneil Dariush at UFC Fight Night 35 in Georgia. Brenneman (19-5, 4-4 UFC), a Pennsylvania native, put together a 4-4 record in his first stint with the UFC from 2010-2012 including wins over High, Amilcar Alves, Rick Story, and Daniel Roberts. He was cut from his contract after a second straight loss to Kyle Noke at UFC 152, and he then returned to the regional scene where he was sponsored by the Intimidation brand in a pair of bouts. “The Spaniard” compiled a 4-0 record on the regional scene after dropping to the lightweight division, including a recent victory over Kyle Baker to claim the CFFC lightweight title. He will return to welterweight for the short-notice fight against UFC newcomer Dariush (6-0), but he will likely return to 155 pounds after the bout. Brenneman joins Intimidation alums Jessica Eye, Stipe Miocic, Daron Cruickshank, Roger Bowling, Sara McMann and Anthony Lapsley in the UFC. Intimidation has also sponsored seminars with UFC contenders Gray Maynard and Matt Brown in recent years. Intimidation Clothing is a fast-growing brand of MMA lifestyle apparel with a growing national presence and over 50 authorized dealers across the USA. Known as the biggest supporter of local MMA, the Intimidation brand is also regularly featured on multiple sporting events on SpikeTV, AXS TV, SportsTime Ohio, MTV2, FUEL TV, The Comcast Network, Comcast SportsNet and EpixHD as well as MMA highlight shows on Spike TV, AXS TV and more. In addition to over 110 styles of high-quality, bold t-shirts and sweatshirts for men, women and children and is also known for their premium-quality EliteFighter MMA board shorts. Anyone interested in becoming a dealer can apply to sell the Intimidation brand as a dealer and they can be found for sale online at IntimidationClothing.com. Fans can also follow the marketing wing of the Intimidation brand, Intimidation Interactive Media, @IntimidationIM, like Intimidation Clothing on Facebook or follow @IntimidationMMA on Twitter. Intimidation Clothing is pleased to announce that Team Intimidation alum Anthony “The Recipe” Lapsley has signed with the UFC, and will debut next month at UFC 167. Lapsley (22-5) will take on veteran Jason High (17-4) in a preliminary welterweight bout during the UFC’s 20th anniversary event in Las Vegas. A native of Indiana, Lapsley brings a 4-fight winning streak into his UFC debut, including three submissions. Intimidation has sponsored Lapsley in multiple bouts, including his most recent victory over Gerald Meerschaert at Rocktagon 23 in Cleveland earlier this year. The veteran fighter has earned 15 career submission victories, and he has won 8 of his last 9. His only loss was a controversial submission loss to Jay Hieron during a Bellator tournament bout, where the referee stopped a bout calling a technical submission when Lapsley wasn’t unconscious. Nevertheless, the exciting fighter joins a deep UFC welterweight division and looks to move his way up the 170-pound ladder. Lapsley joins an exclusive list of Intimidation Alumni currently signed to the UFC’s roster, including top heavyweight prospect Stipe Miocic, women’s bantamweight contenders Jessica Eye & Sara McMann, and exciting lightweights Roger Bowling and Daron Cruickshank. Intimidation Clothing is pleased to announce the official release of its “I Love #WMMA” tees, available in both men’s and women’s styles. As a longtime supporter of women’s MMA, Intimidation is pleased to be a part of the recent boom in popularity for the “softer” side of mixed martial arts competition. Intimidation has long been a supporter of WMMA, including sponsoring multiple top fighters like current UFC stars Jessica “Evil” Eye & Sara McMann, current star on The Ultimate Fighter 18 Jessamyn “The Gun” Duke (pictured, right, with UFC Champion Ronda Rousey), former world title challenger Jan Finney, and many more. In addition, Intimidation has sponsored many of the top promotions who have historically supported women’s MMA the strongest including the NAAFS, HookNShoot, Absolute Action MMA and more. Intimidation Clothing was also a title sponsor for Ohio’s first all-female MMA event, NAAFS: Eve of Destruction, which was held in September 2010. Available in a 100% cotton white men’s tee and a ultra soft cotton/poly blend women’s tee in heather gray, the new shirts will be ready to ship by late October and are currently available for pre-order at IntimidationClothing.com using the links below. Strong Style MMA & Fitness Center, located outside of Cleveland in Independence, Ohio, is widely regarded as one of the top gyms in the Midwest. In addition to sponsoring many of the gym’s fighters, both pro and amateur, Intimidation Clothing is proud to have Strong Style as one of its official dealers. With many Intimidation-sponsored fighters on the roster, first and foremost at Strong Style is head coach Marcus Marinelli and jiu-jitsu coach Pablo Castro. Also on the roster are UFC heavyweight Stipe Miocic, Bellator fighters Brian Rogers and Jessica Eye, UFC veteran Forrest Petz, and regional stars Nick Duell, John Hawk, Joe Heiland, and more. The gym’s success on the regional MMA level has caused many young fighters to gravitate to the gym, and the gym’s connections outside of the state of Ohio, and even outside of the USA, are evident in some of the names that have traveled to Independence, Ohio to train. UFC middleweight Chris Camozzi, UFC women’s bantamweight Sara McMann and popular Russian fighters Ruslan Khaskhanov (11-5) and Maxim Grishin (14-6). Strong Style features programs for the entire family and any type of athlete, from Little Leaders Karate for 3-5 year-olds, to Youth MMA for kids 6 and up (including boxing, judo, grappling, and wrestling). The gym also has adult programs, as well as a state of the art Fitness Center that takes up one side of the gym. Inside the Fitness Center section of the gym the retail section features the exclusive Intimidation/Strong Style board shorts, signature shirts featuring Jessica Eye, John Hawk, Forrest Petz and Brian Rogers and co-branded t-shirts and beanies. For more information on Strong Style, visit www.StrongStyle.com. Well this week marks the peak of my summer. Just returned from Washington state where I was surrounded by natural beauty and some appreciative fighters at a music and MMA festival that took place in the town of Cheney. Was a very enjoyable experience and a getaway for me I desperately needed. Now to Kansas City for Saturday’s blockbuster Invicta 2 event that will draw the attention of all of MMA as the women show they are the best draw around! The list of names is too long, but ticket holders as well as internet viewers will see Sara McMann, Liz Carmouche, Kaitlin Young, Shayna Baszler, Barb Honchak, Jessamyn Duke and Lacey Schuckman are just a FEW of the female stars that will be present. It will be a great chance to show my expertise to a new audience in the sport. Truly cannot wait and am very blessed to be a part of the event. In what is now a regular column here at IntimidationMMA.com, David Maldonado, sports medicine expert, sports rehab specialist and MMA cutman tells us about his journeys across the USA working at MMA events. 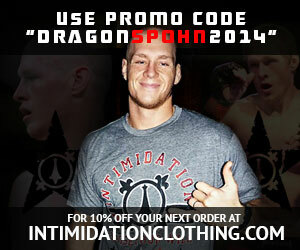 Sponsored by Intimidation Clothing, David has seen it all and looks to help educate fans and fighters alike. Maldonado has stayed busy closer to home in Indiana of late with multiple events in his home state in May and a busy Summer MMA season of events upcoming across the Midwest. Also be sure to check out the ProFightingFans.com interview with David Maldonado, The Complete Cutman. Happy upcoming Father’s Day all you guys out there! This weekend for me is one of my most awaited opportunities I’ve had in recent memory. An absolutely STACKED weekend begins Friday when Titan 23 takes place in a unique venue in Fort Riley, KS at the Army Airfield. Joe “The Nose” Wilk, Jorge Santiago, and many other top fighters from across the country. This will be seen on HDNet for those unable to witness it live in person. From there I will head to Springfield, MA to invade the Northeast for the first time and I’m very excited! Mass Mutual Arena will host Battle Xtreme Championships on Saturday where multiple names will be entering the cage in this inaugural event. Rory Markham, Drew McFedries, and Sara McMann are just a few of the amazing fighters who will entertain the crowd. I’m blessed to be a part of these shows and hope to add to the success of both promotions! David Maldonado is a sports medicine expert, sports rehab specialist and MMA cutman who has worked events in eight Midwest states. With a doctorate degree in physical therapy, he combines his certifications as an athletic trainer and strength and conditioning specialist to assist fighters and other athletes inside and outside the cage. His formal training and experience of over a decade have allowed him to work in the NFL and with multiple major universities across the country. Intimidation Clothing is a fast-growing brand of MMA apparel & fight gear based in Ohio with a strong presence throughout the Midwest USA. In addition to over 50 styles of high-quality, bold t-shirts, the company is also becoming known for their premium-quality MMA fight shorts, rashguards and more available online at IntimidationClothing.com. Fans can like Intimidation on Facebook and follow Intimidation Clothing on Twitter @IntimidationMMA. Photo courtesy of James Rice, Jr.
As the Intimidation brand continues to build it’s name in world of Mixed Martial Arts, another big step was taken on Saturday night on HDNet. Sara McMann, one of the fastest rising stars on women’s MMA, and Ryan Martinez, a heavyweight who is also quickly making a name for himself, both score impressive wins at ProElite 3. The event, held in Honolulu, Hawaii and televised live on HDNet, featured an impressive fight card including the ProElite Heavyweight GrandPrix semifinals, McMann vs. Akano in the co-main event, and Kendall Grove against Minowaman in the night’s main event. Sara McMann, the silver medal winner in the 2004 Olympic Games in Athens, is also a 3-time medalist at the FILA World Championships, taking home silver in 2003 and bronze in both 2005 and 2007. Fighting 7-year pro Hitomi “Girlfight Monster” Akano (18-9), McMann controlled the fight taking Akano down almost at will and defending submission attempts throughout. In the end the judges all scored the fight 30-27 in favor of McMann, who is now 5-0 as a pro (2-0 ProElite) and quickly moving up the ladder in the 135 pound weight division of women’s MMA. The sponsorship of McMann continues a long line of sponsorships of popular female MMA fighters, continually showing their support of women’s MMA. Also sponsored in the recent months along with McMann is popular Cleveland-based Bellator fighter Jessica Eye along with Andria Caplan, Erin Toughill, Kaitlin Young, Amanda LaVoy and former Strikeforce top contender Jan Finney. Intimidation Clothing is a fast-growing brand of MMA apparel & gear based in Ohio with a strong presence throughout the Midwest USA and a growing national presence having been featured on multiple events on MTV2 and HDNet in recent months. In addition to over 50 styles of high-quality, bold t-shirts, the company is also becoming known for their premium-quality EliteFighter MMA board shorts, as well as vale tudo shorts, rashguards and more available online at IntimidationClothing.com. Fans can like Intimidation on Facebook and follow Intimidation Clothing on Twitter.